BEEVILLE—In the defensive battle that was the Pleasanton-Beeville game Friday, it was only right a turnover sealed the deal. Eagles cornerback Nick Ramos jumped a comeback route for a late interception that clinched Pleasanton’s 17-14 win at Veterans Memorial Stadium. Pleasanton sophomore Dalton Hobbs grabs a pass over a Beeville defender Friday night. The victory pushed the Eagles to 9-1 overall and gave them a share of the District 15-4A Division I championship. The game-sealing interception came off a Justin Gomez pass, who moved from receiver to quarterback with 9:25 left in the game. Gomez led the Trojans’ last three drives, finishing 3-for-10 for 31 passing yards. The senior stepped in after Seth Gomez’s second interception. Seth Gomez, a sophomore, struggled passing but ran 21 times for 97 yards and was responsible for both Beeville scores. The younger Gomez pulled the Trojans within 17-14 late in the second quarter with a 60-yard TD pass to Dolton Corpus. It was his only completion in eight attempts. 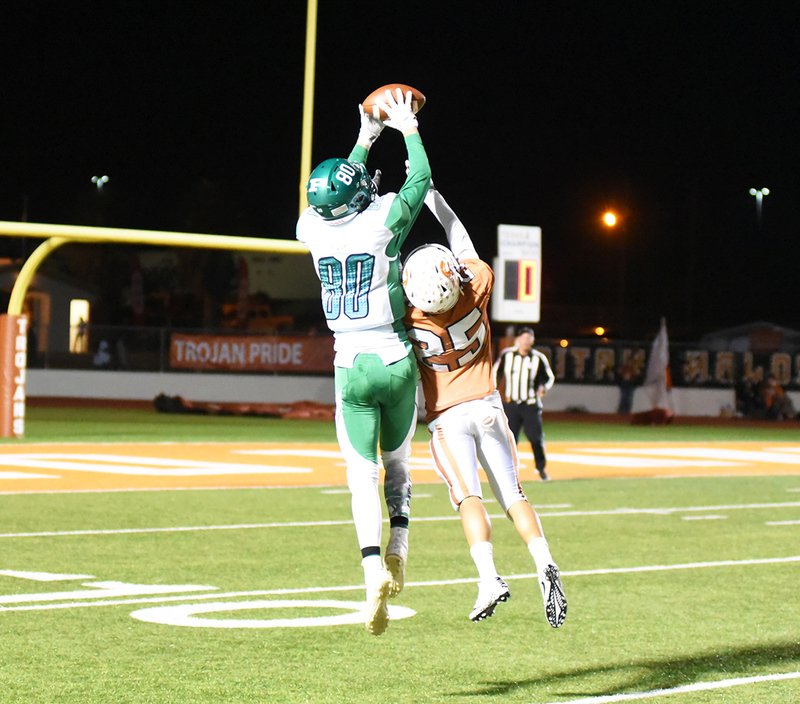 Corpus’ long catch came two plays after Pleasanton extended its lead to 10 points. The Eagles took advantage of a fumble recovery by Louis Arguijo with a one-play scoring drive. Sophomore Dalton Hobbs hauled in his 12th TD catch of the season, a 39-yarder from Johnny Zamora. Zamora went 15-for-29 passing for 171 yards and two TDs. His first scoring pass went 10 yards to Isaac Mendiola to give Pleasanton its first lead. Mendiola had six catches for 82 yards. The Eagles scored all their points in the second quarter, twice starting in Beeville territory after turnovers. Pleasanton had four takeaways, boosting an offense that punted seven times and had a promising drive come up empty as the halftime buzzer sounded. The Eagles fell behind 7-0 after Seth Gomez led a 62-yard, opening series for the Trojans. 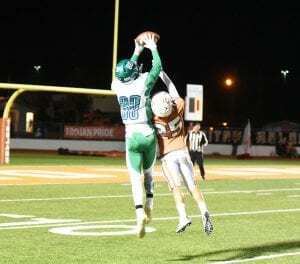 Pleasanton tightened up following the TD and limited Beeville to 249 yards on the night. The Eagles enter the playoffs as the No. 2 seed behind co-champion Somerset. Pleasanton will face Rio Grande City Grulla at 7:30 p.m. Friday at Corpus Christi Flour Bluff. The Gators finished the regular season 5-5.